An annual heirloom tomato that is not hybridized and propagated by open pollination. Called tree tomato because the sturdy potato leaf plants have thick tree-like vines that grow up to 1.5m tall. 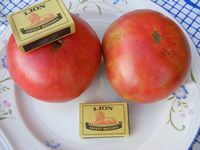 Produces very sweet, large blushed pink tomatoes up to 900g each with meaty flesh and a few seeds - tested to be among the lowest for acid. Requires full sun and can grow in any moist soil. As soon as the plant start to grow it needs to be properly supported with canes, strings, a frame or a trellis. Use fresh or cooked. It has a full sweet flavor that makes it excellent for canning, freezing and slicing. The fruit as they ripens.